Sound Blaster Arena Surround Gaming Headset Review: Who's That Sneaking Up On Me? Over the years sound has increasingly taken the back seat to the other important elements of a PC gaming experience from mouse and keyboard to the graphics and light-kits. But Creative and Sound Blaster have never given up the good fight. Are their Arena Surround gaming headsets a must have for PC gamers or just another added frill? Let's see. Approaching Footsteps: What initially drew my interest to the Arena headphones was reading a review from someone who claimed that the quasi-cans actually improved their first-person shooter game. "Not for a minute," I thought. Then I tried them. Turns out they do, to a degree. I'm a camping sniper. I don't spawn camp, not by a long shot, but I do camp. And when I'm playing with my back to the stairs, or the roof, or what have you, I tend to grow paranoid. In the past I'd swivel around every few minutes to make sure there wasn't anyone back there... watching. Now I can actually hear someone creeping up on me. Their footfalls or shuffles giving them away as they try to creep up on me. It's pretty amazing. Comfort: Extended PC gaming sessions often leave me with sore ears. That's because with wife and son, my late night gaming requires headphones. But these earpads are light and padded just right. The headset itself also features a comfy pad that rests on your head to hold them in place. And they're super light. In-Line Volume and Mute: Simple and lit to show when it is muted, the USB cord also features an in-line, easy-to-use volume button. Detachable Microphone: The swing-down boom microphone is at the end of a flexible piece of rubber and, the best part, you can easily pop it off if you don't plan on using it. A Microphone That Listens: The Arena headsets features extra microphones on the boom that can be used for active noise cancellation while speaking to people. It's a neat feature that works great in noisy environments, but may be a bit too vigorous in your normal gaming setting. Software Suite: There's a nice collection of software that comes with your headphones including an audio console and programs that can make your voice sound like a man, a woman, robots or orcs. Price: $100 seems a bit steep for these lightweight, mixer-free headphones. But maybe I'm just stingy with how much I'm willing to spend on audio. USB: It is, I think, often contradictory to sell USB headphones for gaming. The problem is that if you're using USB headphones then chances are some of your computer's resources are being needlessly sucked up. Also there's the issue that once you plug a USB headset in you can no longer use any sound card or speakers you have set up until you unplug the set. While the lack of a mixer to fine-tune your audio experience is a bit of a bummer and the price a bit high, the excellent 3D positional surround sound is a huge plus. In the end you're going to have to decide how much processing power you're willing to give up via USB sound in favor of plug-and-play audio. 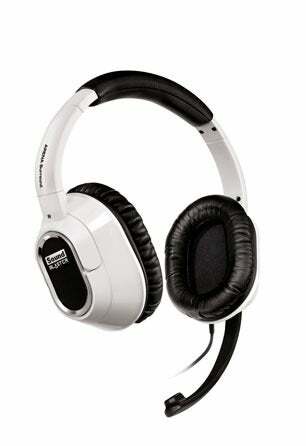 The Arena Surround USB Gaming Headset was developed by Sound Blaster for the PC. Retails for $99.99 USD. A pair of the headphones were given to us by the manufacturer for reviewing purposes. Used headphones for a variety of games, podcasts, and audio over the course of several months.